The very existence of the Behinger Model D has divided opinion, but just how good is this “homage” to the Minimoog? I doubt that there has ever been an analogue monosynth as contentious as the Behringer Model D. On the one hand there are those who think that, if the company is able to manufacture good instruments for a fraction of the price of its competitors, it should be applauded. On the other, there are those who have qualms about a manufacturer that is comfortable copying designs from elsewhere, especially when the original products are still in production. And let’s be clear, the Behringer Model D has caused such uproar not because it’s a well‑specified analogue synth at a keen price but because it’s a copy of the Minimoog Model D that was launched in 2016. To deny this would be ridiculous; its underlying architecture, features and panel layout are almost identical to the Moog’s, and the use of blue switches where the authentic Moog has red ones (and vice‑versa) isn’t going to fool anyone. The manual even states that the Behringer Model D (which, from this point on, I’m going to call the BMD) is, “an ultra‑affordable homage to an iconic synthesizer, with all the features of the original”, and that “great care has been taken in designing the Model D including the true to the original ‘D Type’ circuitry with its matched transistors...”. But how good a copy is it? Weighing in at less than 2Kg, the BMD feels solid despite being small and light. Its knobs are firm and smooth, although I’m a bit concerned that they’re not secured to the panel itself because that would have reduced flexing of their connections to the PCB. Its switches are also positive in action and, although I’m no great fan of 3.5mm I/O sockets, these also worked well with the exception of one that needed an enormous push to insert the cable the first time, but thereafter was fine. Like the knobs, the sockets lack support from the control panel so, after that, I decided to treat them more gently! I followed the manual’s instruction and left the BMD switched on for 15 minutes before using it for the first time. (I would later find that the long wait was unnecessary because the tuning settled more quickly than that.) Some people have reported tuning issues and even attempted recalibration of the pitch and scaling before using it, but the review unit was fine in this regard. I had it sitting on top of an 88‑note MIDI controller keyboard for much of the time and, while I wouldn’t expect its scaling to be perfect over seven octaves, all three of its oscillators stayed in tune with one another and were correctly scaled over five octaves or so, which was impressive. They were also largely immune to drift once warmed up. As you would expect, the BMD’s oscillators (which are based upon the original Minimoog’s 3046‑based ‘Rev 2’ oscillators) produce the same six waveforms as those of the Minimoog Model D; triangle, shark’s tooth, ramp and three flavours of pulse for osc 1 and osc 2, whereas osc 3 replaces the shark’s tooth with a sawtooth wave. 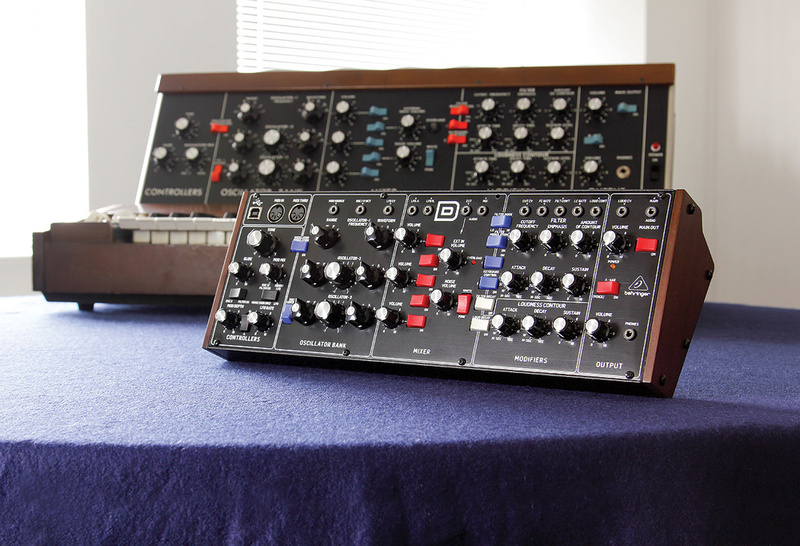 All three also offer the Moog’s five audio footages and low‑frequency option, with detuning of osc 2 and osc 3. (The specification quotes the maximum detune to be ±7 semitones, but I found it to be somewhat wider: from ‑9 semitones to +8 semitones in both cases.) As on the Moog, you can also use osc 3 as a modulation source, either connected to the keyboard CV so that the modulation rate tracks the notes you play, or disconnected so that it runs at a constant rate. With the BMD sitting next to both my original (1970s) Minimoog and 2016 Minimoog Model D, I compared their oscillators, both audibly and using an oscilloscope. Starting with the triangle wave, I found the BMD’s and the Minimoog Model D’s to be indistinguishable, although rather brighter than the vintage Moog’s. The shark’s tooth and ramp waves were all but identical across all three synths, and — to my slight surprise — the square wave and both of the narrower pulse waves were the same on the BMD and the Minimoog Model D. Since the timbre of pulse waves can be affected by minute changes in their duty cycles (and those of my vintage Minimoog have drifted over the past 40 years), the similarity between the two modern synths was remarkable. Next, I tested the outputs from the three synths’ noise generators, which were similar in both their white and pink modes. However, the level of the noise on the BMD was higher than that of the Minimoog Model D.
The last thing to check regarding the BMD’s oscillators was the maximum glide time, which proved to be about the same as the Minimoog Model D’s, and therefore a tad shorter than the original Minimoog’s. At the other end of the scale, the BMD has no glide on/off switch, so you have to turn the knob to zero to obtain instantaneous transitions between notes. With its five sources and associated level controls, the BMD’s mixer appears to be identical with that of an original Minimoog but, like the Minimoog Model D, it hides an extra feature. If you plug nothing into the external audio signal input, the synth’s output is looped back to the external input in the mixer, saving you the trouble of using a cable to obtain the same result. Increasing the level of this loop generates effects ranging from a mild thickening of the tone through to, well... a greater thickening of the tone. The oscillation frequency of the feedback loop is a little higher than that of the Minimoog Model D (which suggests that its path is somewhat shorter) and the wild excesses of some synths when abused in this fashion are beyond the BMD but, since I never found a use for such mayhem, I’m not going to worry about that. 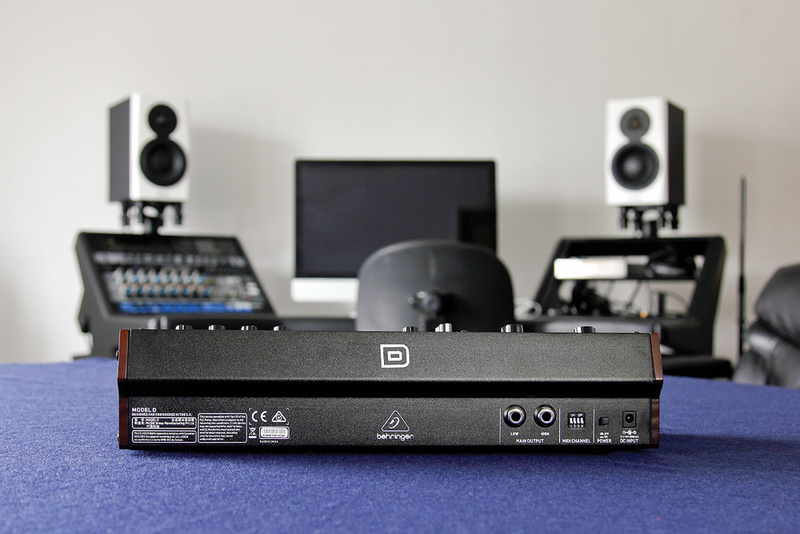 The Model D’s back panel is fairly sparse, featuring high and low audio outputs on quarter‑inch sockets, DIP switches for selecting the MIDI channel and an input for the external 12V power supply. We now come to the filter section, and this is where we encounter the first significant difference between the BMD and the Minimoogs; Behringer have made their resonant 24dB/oct filter dual‑mode, giving you the choice of the standard low‑pass mode or an unexpected high‑pass mode. Apart from this, the filter section seems identical with that of the Moogs, offering the same cutoff frequency and emphasis (resonance) controls, the same ADS(D) contour with its associated Amount control, the same modulation on/off switch, and the same tracking options: 0, 33, 67 and 100 percent. Testing the filter in low‑pass mode revealed that, although the amount of resonance decreased as I reduced the cutoff frequency, the BMD’s filter is capable of self‑oscillating all the way down to 64Hz whereas, on my vintage Minimoog, the lowest frequency of self‑oscillation is around 150Hz. This is important because increasing the emphasis of a Minimoog filter attenuates the lower frequencies passing through it. Consequently, with its filter cutoff frequency tracking the keyboard and the emphasis turned up, bass sounds created on the BMD could suffer a little in comparison. However, I found that if I reduced the emphasis to around 9 on the BMD, the filter’s response was almost identical with that of the vintage Moog’s. This is exactly what I discovered when reviewing the Minimoog Model D two years ago and, with appropriate tweaking (ie. carefully tuning the filter and reducing the emphasis a little on the two modern units) the same, glorious bass sounds can be obtained on all three instruments. When set to 100 percent, the BMD’s filter tracking is not quite accurate across the width of a 44‑note keyboard, but if you switch on one or more of its oscillators and tune the filter in unison it will lock to them and track correctly. Again, this is just like the Minimoog Model D.
As for the filter’s dedicated ADS(D) contour generator, this seems, at its fastest, to be as snappy as the original’s. At the other end of the scale, I measured the maximum attack to be a little over seven seconds and the maximum decay to be an impressive 70 seconds — the first a little under spec (but the same as the Minimoog Model D) and the latter considerably over. The signal now passes to the VCA with its dedicated ADS(D) contour generator. Again, this is nice and snappy at its fastest while, at the other end of the scale, it offers a maximum attack time of around 11s and a maximum decay/release time in the region of 22s, which is a bit short of spec but again close to the response of the Minimoog Model D.
It was now time to see whether the BMD’s contours echo the unusual way that the Minimoogs’ contours behave when you play notes rapidly. To understand this, imagine that you play a single note on a typical monosynth; the contour enters the attack phase at 0V and increases toward its peak voltage in the time determined by the attack parameter. It then decays to the sustain level (whatever you set that to be) and finally, when you release the key, it enters the release stage. Whenever you next trigger a note, the attack will pick up from the voltage that the release has reached, and again head off to the maximum voltage before entering the decay phase and the rest of the cycle. But on a Minimoog, if you play the next note early in the release stage of a previous one, the second attack peaks a little higher than the first, and the third peaks a little higher than that, and so on. Consequently, some Minimoog patches become brighter and louder when played rapidly. Both the original Minimoog and the Minimoog Model D exhibit this behaviour, so I was curious to find whether the BMD does likewise. It does (which is great) but testing this revealed a problem that I’ll discuss shortly. It’s worth noting at this point that the BMD’s filter contour and loudness contour have separate gate inputs, which is unusual in an integrated synthesizer and not something found on the Minimoog Model D. Unfortunately, there’s no way within the BMD itself to tie these together, so you’re going to need a multiple or a ‘Y’ cable to play it conventionally using CV+gate signals. Despite the density of controls on the top panel, I would have found somewhere to add a switch to link them when wanted. Also unlike the Minimoog Model D, the contours have independent decay (release) on/off switches. This is an interesting touch, but I can’t think of many (any?) occasions when I would find it useful. As you would expect, the BMD offers the Minimoog Model D’s five modulation sources: osc 3 or the filter contour generator at the anticlockwise extreme of the Modulation Mix knob, and noise or an external signal presented to the modulation input or the dedicated square/triangle wave LFO at its clockwise extreme. You select any of the six combinations using the appropriate switches and then determine the relative contributions using the knob. Nonetheless, there are differences between the two synths. Firstly, a Mod Depth knob on the BMD emulates the Moog’s modulation wheel, which is a sensible addition. Secondly, while the BMD’s maximum modulation depth is similar to that of the Minimoog Model D, it’s less than that of my original Minimoog, which has consequences for some heavily modulated sounds. Thirdly, the minimum frequency of the BMD’s LFO is rather higher than that of the Minimoog Model D, so the very slowest sweeps are beyond its capabilities. Finally, there’s a SysEx parameter on the BMD (see ‘Configuring The BMD’ box) that allows you to set something called the Modulation Curve to one of three values: soft, medium or hard. 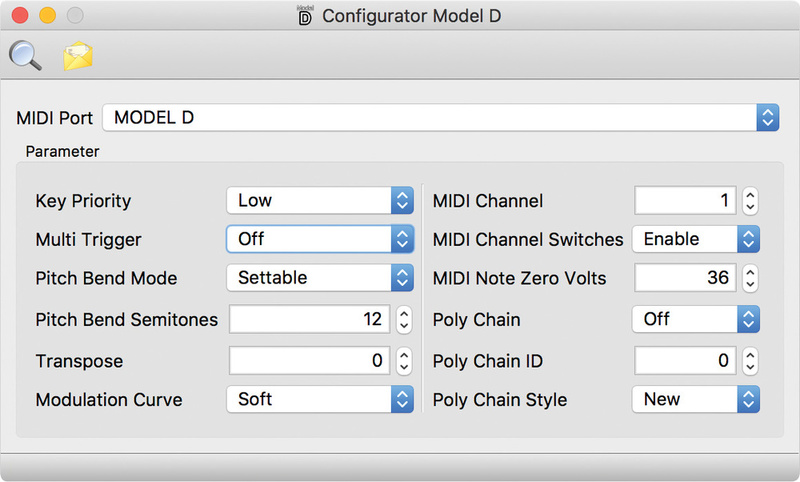 If this changes the way that the knob — or the mod wheel of a connected MIDI keyboard — controls the modulation depth it will be more than welcome. (On a Minimoog, most of the useful functionality is crammed into the first few degrees of rotation.) Unfortunately, despite being able to get other SysEx parameters to work, this one seemed to make no difference. Perhaps it’s something for a future update. The rest of the panel is as you would expect, with the master tune control to be found in the Controllers panel, and the master volume control, A=440 tuning switch and headphones output with its associated volume control in the Output panel. The Model D’s front panel is considerably smaller than a Minimoog’s, but manages to squeeze everything into its 374 x 136mm. I can imagine that, when designing the BMD, Behringer’s engineers were desperate to stamp something of their own creativity upon it. They did so in a novel way; they made it Eurorack compatible, and it even comes with a Doepfer‑style power cable to connect it to the rack’s power supply. This means that the case in which it’s supplied is merely a 70HP ‘boat’ that provides a DC power input, some DIP switches for MIDI channel selection and a couple of audio outputs. Removing the BMD from the boat should have been simple — just undo the eight top‑panel screws and disconnect the cables that connect the PCB to the rear panel. But while seven of the screws were fine in this regard, one was impossible to budge and, despite my best efforts, I eventually had to trundle along to my local hardware store to buy a special bit so that I could drill it out. This is not a procedure that I would recommend since a bit that will eat out the centre of a steel screw will, if you slip, make a serious mess of an aluminium control panel. Happily, I managed to remove the eighth screw without wrecking anything, and then lifted the BMD from the boat ready for mounting in a Eurorack case. That was when I discovered that, rather than use conventional rack rails, Behringer have used four sliding eyes in each rail to secure the screws. These proved to be less than ideal when I later had to return the synth to its own case. Having removed the synth from the boat, the placement of all of the BMD’s sockets (including a third audio output — see 'I/O' box) on its top panel made perfect sense, although the loss of the channel selectors from the rear panel soon made itself felt. Without these, you have to use multiple SysEx strings to disable the switches (even though they’re no longer there) and to change the MIDI channel. Had I been on the design team, I would have found a way to incorporate a small 16‑step rotary switch on the top panel for MIDI channel selection. The other major addition is Polychaining. This allows you to chain up to 16 BMDs to create a polysynth, much as multiple SEMs were used to create the Oberheim 4‑Voice and 8‑Voice. The way in which the BMDs respond to incoming MIDI messages then depends upon the operating system installed. On the current version, they work correctly: the first BMD in the chain plays the lowest MIDI note received and the rest of the notes are passed to the second. This then plays the lowest note received and passes what’s left to the next, and so on. If you play fewer notes than there are BMDs in the chain, any unneeded synths remain silent. On early versions, any unused BMDs also played note number 1, meaning that the lowest note was often thicker and louder than any of the others. This must have been horrible, and I’m relieved to find that it has been corrected. I was keen to find out whether the BMD responds like a Minimoog Model D when used musically. Of course, there’s at least one glaring difference between the two — the Moog has a keyboard that generates both velocity and aftertouch, transmitting these over MIDI and as analogue CVs that you can direct back to its own control inputs to great effect. It also responds to MIDI velocity messages. In contrast, the BMD responds to neither velocity nor aftertouch, although you can make it touch‑sensitive if you convert the MIDI messages to CVs and then direct them to the appropriate inputs. However, the BMD scores over the Minimoog Model D in one important respect: it responds to MIDI modulation. 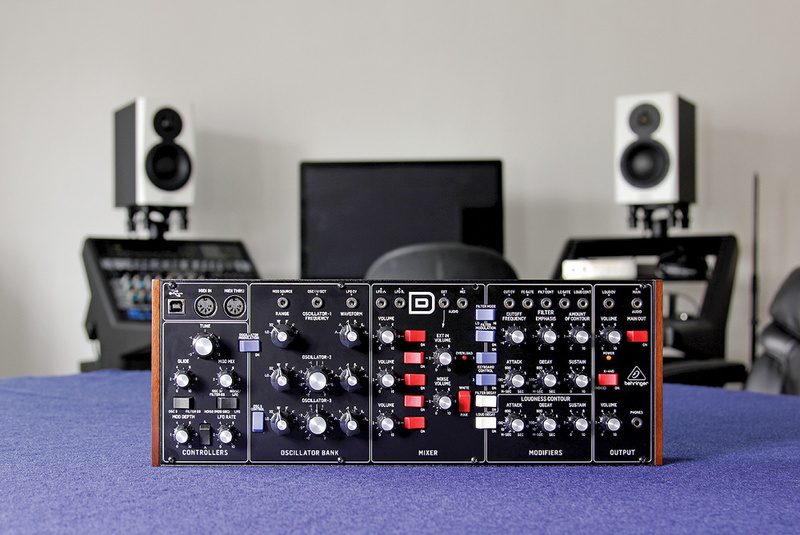 Moog omitted this for what, at the time, seemed like good reasons, but Behringer have clearly overcome the difficulties and this is a strong point in the BMD’s favour. In addition to these pros and cons, I encountered two unexpected and potentially serious problems when playing the BMD using MIDI. The first concerned triggering; when I played rapidly, new notes didn’t always retrigger the contours, even in multi‑triggering mode. As a widdly‑widdly soloist, this makes the BMD pretty much unusable for me. The second was a real oddity: you can’t pitch bend a note once its Note Off has been received. Let’s hope that both issues are caused by firmware errors that can be fixed in an update. Up to this point, I had only played the BMD using MIDI. To test it in an analogue environment, I would have loved to have created a pseudo‑Minimoog by installing it in my Analogue Systems Sorceror (a four‑octave keyboard with a wide, sloping Eurorack enclosure in place of a synth engine and control panel) but this was unavailable at the time so there was no opportunity to pursue the idea. Had I had two BMDs to hand (which, at 70HP each, would have occupied just 140HP of the Sorceror’s 168HP) I could even have mounted both and experimented with Polychaining. But I didn’t, so I couldn’t. Instead, I hooked it up to a simple monosynth to test how it responded to being played via CV+gate. I immediately re‑encountered the triggering problem — sometimes notes triggered, sometimes they didn’t. Given that control using CV+gate precludes multi‑triggering (you need a separate trigger input for that), notes should never retrigger when a second note is played before the first is released, but they should always do so when the second is played after the first is released... and this wasn’t happening. I tested this with manual playing, arpeggiating and sequencing, and the fault was consistent in all cases. Indeed, when arpeggiating and sequencing, nothing triggered after the first note! It seemed odd that this should occur both when playing via MIDI and when playing via CV+gate, so I tried to think of a way to investigate it further. Since the problem seemed to be something to do with gating I hooked the BMD up to my Korg SQ‑1, which seemed to me to have the correct facilities to examine this. Switching the Korg to single row operation and using the second row to adjust the ‘duty’ (the gate length relative to the note length) on each step revealed what was happening. When the gate length is equal to or nearly equal to the note length, the BMD doesn’t register the next gate in the sequence, which means that the following note isn’t triggered. This is irrespective of whether the connection between the sequencer and the synth is analogue (CV+gate) or digital (MIDI). What’s more, the faster the sequence runs, the shorter the duty has to be to maintain a sufficient gap between one note and the next to ensure correct operation. This then explained the problems I had encountered when playing manually; when I released a note immediately before playing the next, the pitch changed but the second gate was ignored. It also confirmed that the BMD won’t respond correctly to arpeggiators, which is a huge shame. Amazingly, the Minimoog Model D suffers from the same problem when sequenced using CV+gate, although not when sequenced via MIDI or when played from its own keyboard. This explains why I had never encountered it before. Another difference between the Moog Model D and the BMD became apparent as I created and experimented with the various patches that I had used to investigate this problem. Whether by luck or by genius, Minimoogs boast a control panel that encourages programming and performance. The BMD has an almost identical layout but adds a handful of extra controls, all compressed into a much smaller space. As a consequence, I found it less inviting to use and that it was too easy to brush against one knob while adjusting another. This is not a problem unique to the BMD; many of the current breed of miniature synths suffer from it, but it’s worth noting nonetheless. So, what of the sound? Happily, this is where everything comes good. As far as I’m concerned, the sound of the BMD is to all intents and purposes that of the Minimoog Model D. I suppose I could be very fussy and complain about the differences in... umm, well... urr... let me get back to you about that. Sure, some knobs have to be in different positions to obtain the same results, and I found small inconsistencies when programming extreme patches, but I must admit to being stunned by how well the BMD mimicked the Moog. With my original Minimoog, the Minimoog Model D and the BMD sitting alongside one another, the sonic differences were no greater than I would have expected when comparing a selection of vintage Minimoogs. In addition, the BMD has its high‑pass filter mode, which allowed me to create sounds that were never possible on either of the other instruments, and I have no doubt that this will be a boon when chaining multiple units into a polysynth. Finally, I have to return to a recurring complaint. As regular readers will know, I’m not a fan of external power supplies, especially if they can find themselves in inclement environments such as stages. Unfortunately, the BMD uses a 12V DC wall‑wart with a thin cable terminating in a barrel plug, and there’s not even a stress‑relief hook to reduce the chances of an accident. This may be acceptable in the bedroom, but the sound of the BMD deserves better. On the one hand, the BMD is a blatant a copy of an existing synthesizer, and the best thing that you can say about the decision to usurp the original’s name is that it lacks class. On the other, many manufacturers have been cloning the Minimoog or aspects of the Minimoog’s architecture since the 1990s, and I don’t see them being vilified for doing so. So let’s skirt such issues and sum up the instrument on its merits. I love the Minimoog Model D, which is a superb performance synth and, while the compact control panel and the lack of a keyboard mean that the BMD doesn’t offer the same playing experience, sonically the results are all but identical. As for the BMD’s additional features, these add flexibility without detracting from anything that makes the Minimoog Model D such a great instrument. However, I can’t overlook the BMD’s retriggering problem and, until this is rectified, it’s not a synth that I could use, no matter how affordable. Ah yes, the price. Perhaps the biggest surprise about the BMD is not how accurately it mimics the Minimoog, but how Behringer have managed to manufacture and sell it so cheaply. Once the problems are resolved it will be almost impossible to ignore it and, philosophical considerations aside, hard to argue against it. It’s possible to calibrate the BMD’s oscillators and the pitch CV that drives them, although you’ll have to remove the synth from its case in order to do so. Tuning and scaling the oscillators and octave divisions using the trimmers looks relatively straightforward but, if you want to calibrate the pitch CV, you’ll need to send a SysEx string to the synth, connect the probes of a voltmeter to two test points on the board, and press specific keys on a connected MIDI keyboard to generate the reference voltages. If I used a BMD, I would want to install it either within my Sorceror or in a sturdy 19‑inch case with the PSU bolted in and the cable restrained to guard against accidents. Unfortunately, Behringer don’t include a set of rack ears with it although, given the price, that’s perhaps understandable. Happily, there’s a company called Bespoke Rack Ears making them, although it seems that these are bent to fit the BMD with its wooden end cheeks still in place. This is weird because the cheeks are purely cosmetic, and there are metal plates beneath them that keep everything solid when the wood is removed. The BMD’s manual talks about a “Comprehensive MIDI implementation”. This is a ridiculous statement because it doesn’t understand MIDI CCs and responds to just a handful of SysEx commands that allow you to configure various performance aspects of the synth. 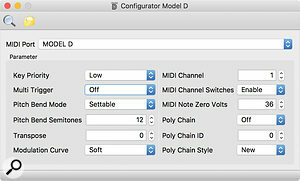 The available parameters are the key priority (low, high, last), triggering option (legato, multi), the maximum pitch‑bend, transposition, the modulation response curve, the MIDI channel, whether the MIDI channel switches on the rear panel are enabled or disabled, which MIDI note equates to 0V when using the analogue connections, and the Polychain setup. The manual explains how to send the appropriate strings of 22 characters for each command, but this is not something that many users will want to attempt, and a much simpler solution is offered by developer masc4ii who has written a front‑end called Configurator Model D that sends the appropriate SysEx when you select your choices within its GUI (https://github.com/masc4ii/ConfiguratorModelD). I installed this and attempted to configure the BMD using it. I found that, while some parameters responded correctly, others had no effect. I wondered whether the review unit might have an obsolete operating system so I download the latest version. I then discovered that the updater software runs only under Windows so I had to unplug the BMD, pack it up, and travel a few miles to gain access to a PC whereupon the software told me, “Latest version: v1.06, version installed: v1.07”. Let’s hope that everything is sorted out by the time that you read this. Happily, you can configure what I consider to be the two most important parameters — the key priority and the triggering mode — using the BMD’s A=440 switch, toggling it on and off a number of times within five seconds of switching the synth on. It’s clunky, but it works. It sounds like a Minimoog Model D.
It responds to MIDI modulation (which the Minimoog Model D does not). Though small, the hardware feels firm and positive. Making it Eurorack compatible was clever. Multiple units can be chained for polyphony. The price is incredibly keen. Notes are not triggered if one is played close to when another is released. As a consequence, you can’t use it successfully with most arpeggiators and sequencers. There’s an error with the pitch-bend implementation when played over MIDI. The MIDI implementation is very basic and the SysEx implementation isn’t quite right yet. The panel is very compact and you can knock one knob while adjusting another. It uses an external power supply and there’s no stress relief for the cable. Behringer call their Model D a “Legendary Analog Synthesizer”. It’s not, of course, but it’s a very good copy of a legendary analogue synthesizer, imitating the form and sound of the Minimoog Model D with remarkable accuracy. It seems to be a work in progress and currently suffers from a significant problem but, once everything is fixed and finished, it will represent astonishing value for money.